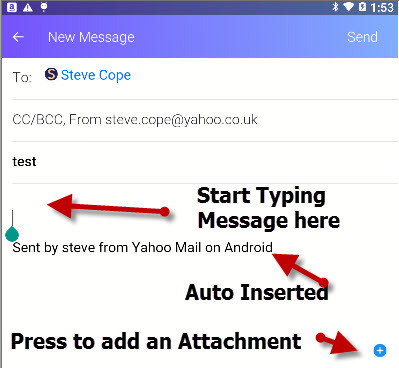 To send an email open the Yahoo email App. The App opens to show your inbox. You can view your other folders by pressing on the far left of the screen and dragging right across the screen. 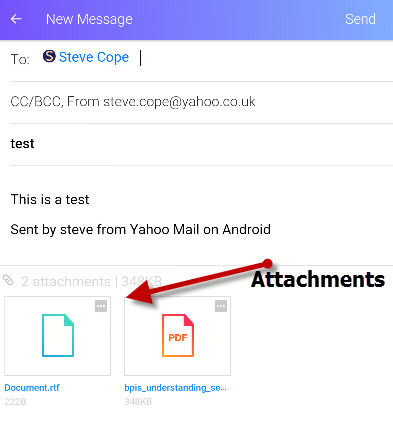 Click the compose email icon at the bottom of the screen. 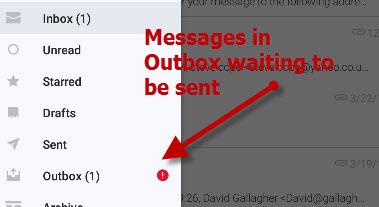 A new message window opens with the cursor positioned on the to line. 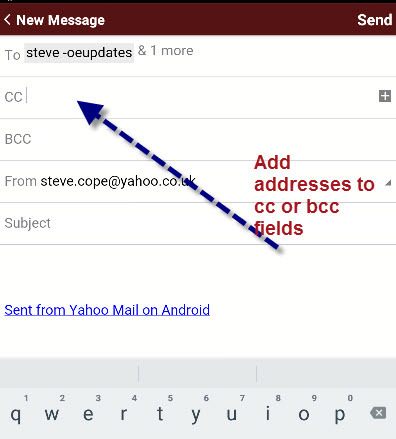 You can click on any of the suggestions to add it to the address line or just keep typing. You can add a second or even more addresses. Important -If you used an auto suggested address the client inserts a space, and you can add the second address. If you type in the address yourself then you need to insert a comma after each address. The client will display a space when you insert the comma, and highlight the address you just added. Don’t try to insert a space! 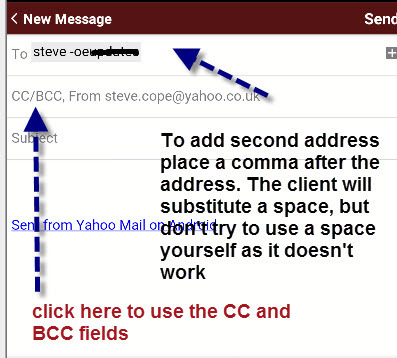 If you need to use the cc or bcc fields click in the cc/bcc link and they are displayed. Next click on the subject line and a blinking cursor (was blue) appears at the start of the line. Type in your subject. 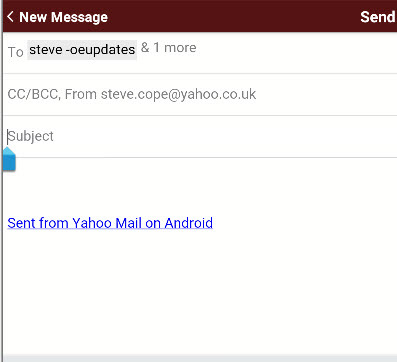 Next click in the message field and a cursor appears above the sent from Yahoo Mail on Android line. 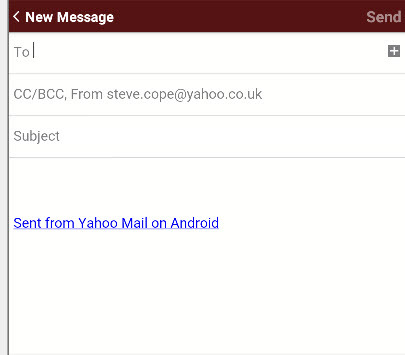 The text-sent from Yahoo Mail on Android– is the email signature which is enabled by default. You can delete it,and you can disable or change it. 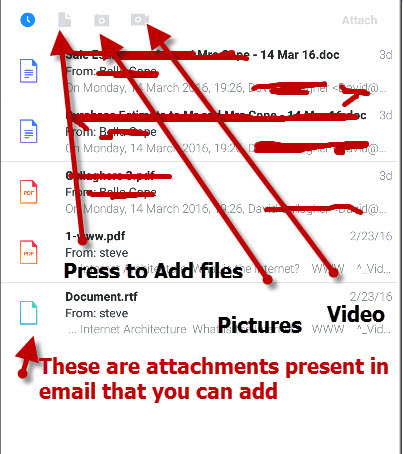 You can add an attachment by clicking the blue attachment icon in the bottom right corner. You can select attachments using the three icons at the top. These icons will show you files,photos and videos on your device. When selected a blue tick appears next to the item but they are not attached. 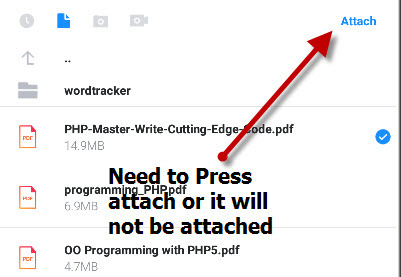 You need to press blue attach link to attach them. Click the back button (bottom main menu) to return to the compose window, and you should see the attachments in the compose window. When done click send to send the email. If you want to exit without sending then click the <- on the top left of the message. 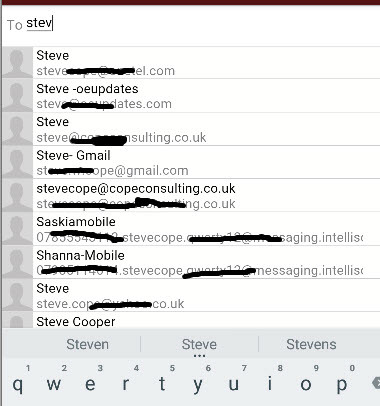 You can read email and compose ,read,reply and forward new emails while working offline. You can only read emails that have been synchronised earlier. You will not be able to download attachments while offline. Any emails that you send are placed in your outbox,and they will be send the next time that you connect to the Internet. A- Yes you need to edit the signatures in the settings. Q Can I cancel sending or recall a message? A- You are briefly given option of stopping sending? However it happens so quick that it is practically useless. Once sent you cannot recall a sent message. Q. Can I use Dropbox with the Yahoo mobile App? A- No I don’t believe you can.